The Birth of a Nation, Nate Parker’s Sundance darling period piece about the deadliest slave insurrection in American history, was purchased by Fox Searchlight on early Tuesday morning for $17.5 million. It was the largest deal in Sundance history, and coverage immediately suggested that The Birth of a Nation will function as some way through which the Academy can make up for this year’s diversity debacle. Nat Turner’s Rebellion is a fascinating story, an important one, and an under-examined one. Nate Parker struggled for years to get the project made, and I have no doubt that—as with almost any film rooted in a black experience or with a mostly black cast—it was a frequently frustrating fight. I will certainly be buying a ticket to see The Birth of a Nation when it comes to theaters. But part of me is torn about sitting through yet another film that centers around the brutalization of black people. Frankly, I’m tired of slavery movies. It’s obvious at this point that Hollywood has a problem with only paying attention to non-white people when they’re playing a stereotype. Their love of the slave movie genre brings this issue out in the worst way. I’m tired of watching black people go through some of the worst pain in human history for entertainment, and I’m tired of white audiences falling over themselves to praise a film that has the courage and honesty to tell such a brutal story. When movies about slavery or, more broadly, other types of violence against black people are the only types of films regularly deemed “important” and “good” by white people, you wonder if white audiences are only capable of lauding a story where black people are subservient. Of the six films actually produced by black people that have been nominated for Best Picture at the Academy Awards, three are about slavery or slavery-adjacent violence against black people (The Color Purple, Django Unchained and 12 Years A Slave). The fourth is Selma and the fifth is Precious, two movies that focus on black women being emotionally and physically beaten down in almost every way possible. The last is the The Blind Side, where a white woman who butts in and makes a black kid who was already a promising athlete into an even better athlete. From a simple visual perspective, I’m tired of being told that I have to watch black actors in physical pain and endure mental abuse for two hours in order to be worthy of a distinction. I don’t want to watch a black body being lashed open so white people can finally “get it.” I’m tired of black actors not only having to live through the trauma of acting in those films, but for also having few other options in front of them. 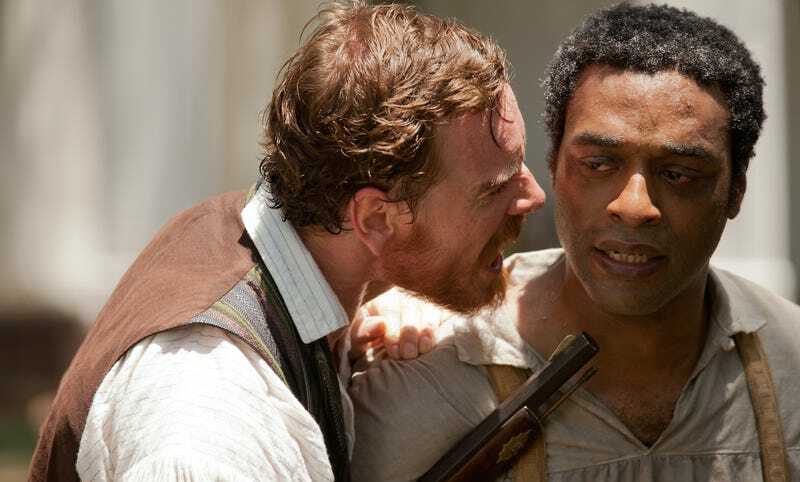 Often, films about slavery receive laborious, highbrow praise for truly showing the horrors of the institution to a larger audience—the unspoken suggestion being that after watching these films, white Americans will better understand and empathize with the slave experience. However, it really smacks of an opportunity to assuage what apparently is a deep emotional burden of being white and having benefited from white supremacy. How nice, that a white viewer can feel good about themselves for shedding a tear during Amistad. As much as I’d like them to, I think it’s clear by 2016 that films about slavery do not help us become a more tolerant or understanding society. I have no doubt that there exists a white person who loved 12 Years A Slave and who also thinks Donald Trump makes some good points. In the case of The Birth of a Nation, one could argue that Parker is educating white audiences about a story they may not have learned otherwise. That’s probably true. Film can be illuminating and didactic, but at the same time, we have a serious problem if Hollywood is anywhere close to being a major source of education about slavery. The complicated, harrowing, lasting history of slavery should be taught in classrooms. No person should finally understand the violence of the institution because they saw Lupita Nyong’o being whipped onscreen. As a black American, slavery is part of my history, but it is by no means all of my history. The disproportionate attention paid to movies about slavery or the Civil Right’s Movement also helps to strengthen the misguided notion that those were the only “bad times” for black people in America. Aren’t we proud of black people for getting through that? It’s a condescending and severely limited lesson. Despite attempts to sanitize the history of slavery, most Americans do know slavery was A Bad Thing; we understand the resilience of black Americans, if only because we’re still here. When will we get anything more complex, or more real? Creatively, these films also face clear limitations. 12 Years a Slave and The Birth of a Nation are historical films inspired by real people. But most slaves couldn’t write or leave behind narrative accounts of their lives, so much of our information comes from the perspective of white people. I want stories about Solomon Northup and Nat Turner and Harriet Tubman to be told. But I also want to watch movies about black debutante balls and the Great Migration and a coming-of-age movie about a black teenager in Houston who loves to skateboard and gets into trouble with her Desi best friend. Those films are surely out there waiting to be made. I guarantee that somewhere there sits a great screenplay about a seamstress who wants to be a nightclub singer set during the Harlem Renaissance. Or a love story about black couple during World War II. Maybe someone right now is working on a biopic about Eartha Kitt or Crispus Attucks or some lesser-known hero like Thomas-Alexandre Dumas, the highest ranking black man ever in a European army and the father of Alexandre Dumas. Until there are other types of films made and recorded as significant contributions to the canon, American audiences will rarely be challenged to see black people as anything other than former slaves, sassy black friends, domestics. Right now, Americans are only comfortable with a certain type of black person onscreen, but I am entirely unconcerned with their comfort. A colleague of mine noted that The Birth of a Nation might be a good way to bookend the slave film genre for awhile. Indeed, as it’s not the traditional slave storyline and as it’s already received the effusive praise of many white people at Sundance, it’s probably going to be great. I like the idea of celebrating this film and then putting a lid on the slavery genre for a while. In that time, we can introduce new narratives and expand the scope of our humanity; we can represent the fullness of our experience, as we and all other minority groups deserve. Audiences will learn to identify with black pain that doesn’t stem from chains and whips. I want those stories to be considered seriously by white audiences, just as movies about white people learning how to ballroom dance or talk to computers or play the drums are. We have more stories to tell. It’s time we give those a fair chance.